Centerville has one of the best looking, and largest, town squares in all of Iowa. It takes a while just to walk around the whole thing. 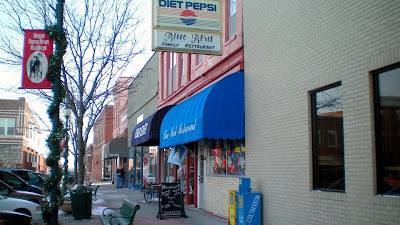 A small sandwich board advertising homemade meatloaf and tenderloins led me into the Blue Bird while in Southern Iowa recently. 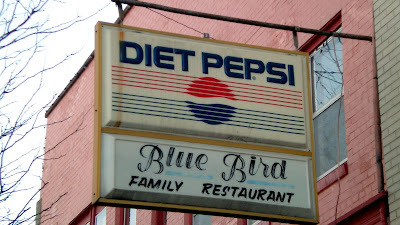 This is a small town family restaurant in Centerville which has been operating in different forms under different owners in the same location since the twenties. It is not to be confused with the Bluebird Diner, the recently opened retro diner in Iowa City. Directions: Its on the South Side of the town square, look for the sign. 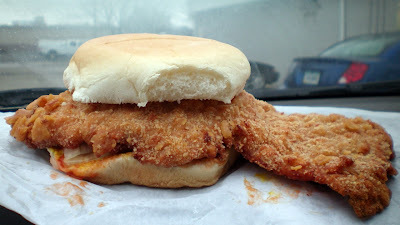 The Tenderloin: Listed on the menu as Hand Made Jumbo Tenderloin. The whole loin was pounded thin and developed a little wave shape. 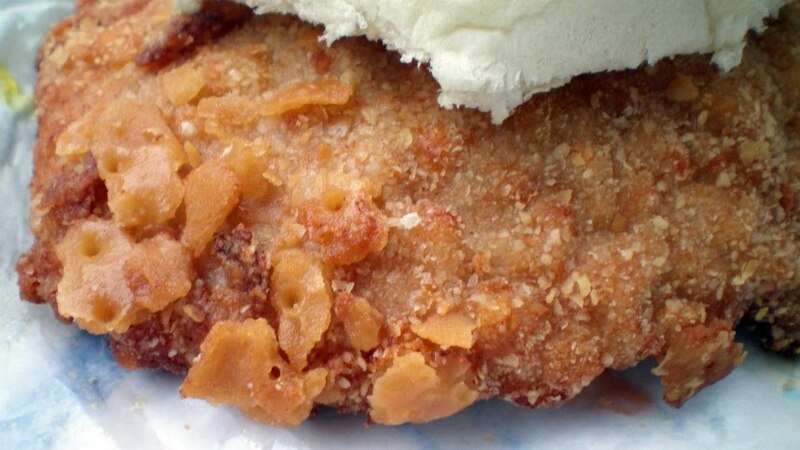 Breading formed a hard crunchy layer outside the white meat. The inside wasn't as soft as most others I have tried. This was an okay tenderloin. 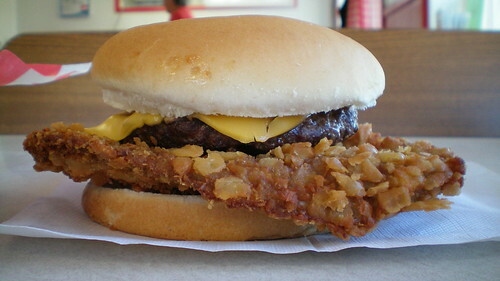 Served on a toasted corn dusted bun. Overall 7.0 out of ten. Price: $4.75 with fries for a dollar more. Also on the menu: Its homemade comfort food including meatloaf and a biscuits and gravy breakfast served all day. Service: Its table service with an attentive waitress also running the counter. 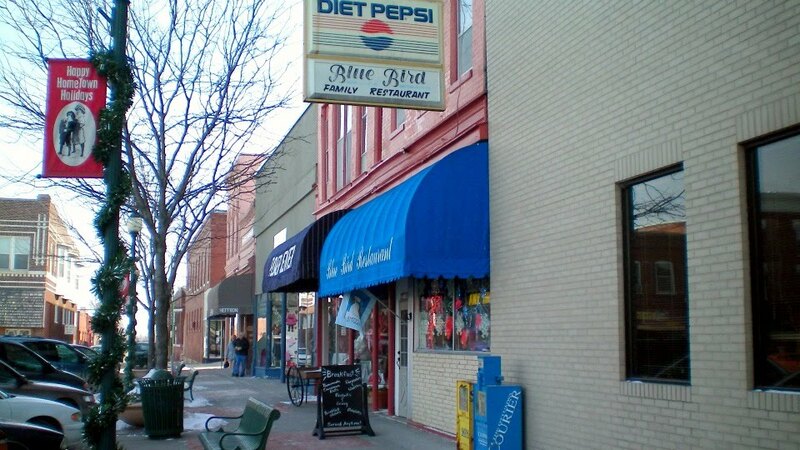 Ambiance: This is a historic building on the square with old booths and an antique counter, but it has been refurbished multiple times under several owners over the decades. There are picture of what it used to be, but now its filled with stuff for sale. Final Thoughts: In the past few years, all of my trips to Centerville have been during the winter months. That is not a bad thing by itself, except that the main drag through town has two seasonal Ice Cream Shops each with competing hand breaded tenderloins. 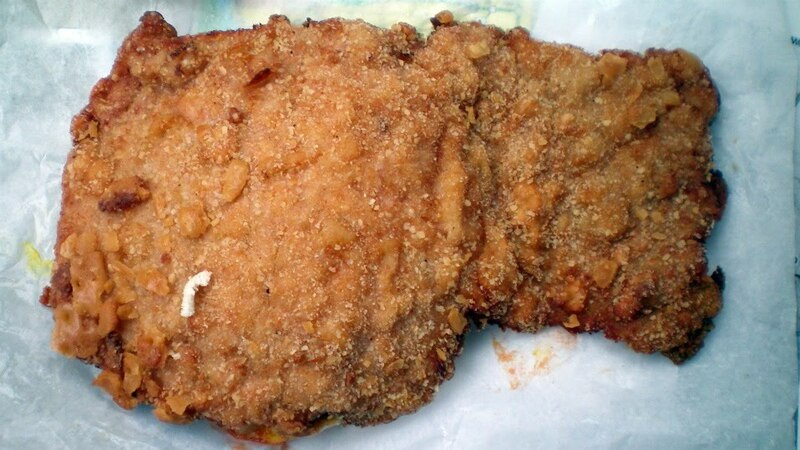 The Double R Dairy Bar has a giant sign with a tenderloin on it, and I get the idea they sell up to a hundred a day in the summer. Raymond's Dairy Creme is also on my list to check out. Across the square the J& K Market has a website claiming their tenderloin is the "biggest in town" and "a labor of love". I just hope I can make it back during the summer someday. Special Note: This review is for Westside Maid Rite in Cedar Rapids, not for any other Maid Rite anywhere else. They are not all the same. 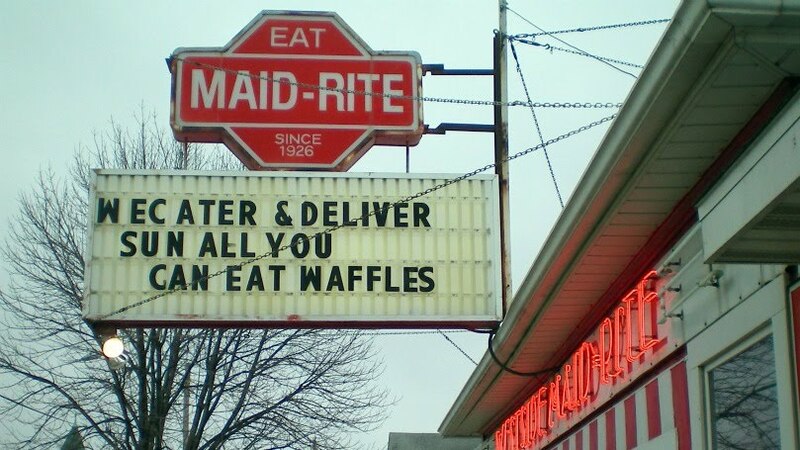 Maid rite is a chain, but it has a unique franchise structure. There are new Maid Rites in distant cities or new development areas with rigorous product homogenization. Then there are owner operated "heirloom" Maid Rites, most easily identified with a proper name in front of the name. These ones often have been run independently by the same family for decades, and often deviate from the regularity of fast food franchises. 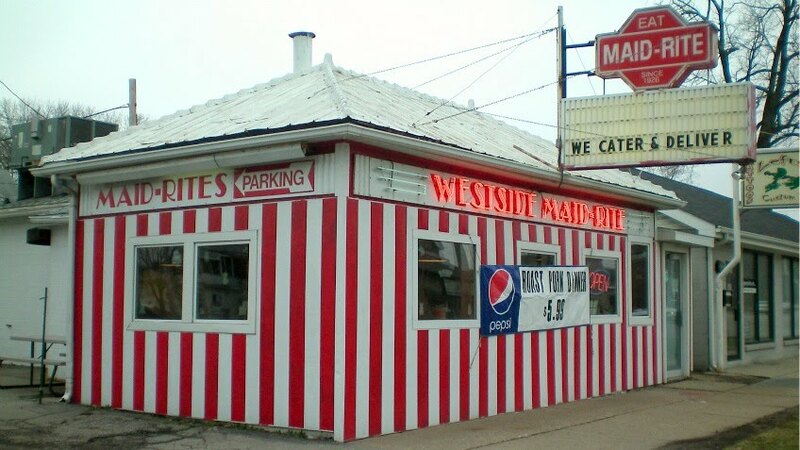 Some heirloom Maid Rites get tired of paying the franchise fee and just take down their sign and repaint in any color but red and white. The vast majority of all these places serve up a frozen tenderloin. I knew that any Maid Rite location could serve a handmade tenderloin, but had never heard of one until reading an ad in Tidbits Newspaper where Westside Maid Rite advertised a half pound tenderloin, clarifying that it was the "biggest & best in town" and "hand made daily". I really can't tell if this location is run by the same folks who run the other one in Cedar Rapids, or the one in Marion. 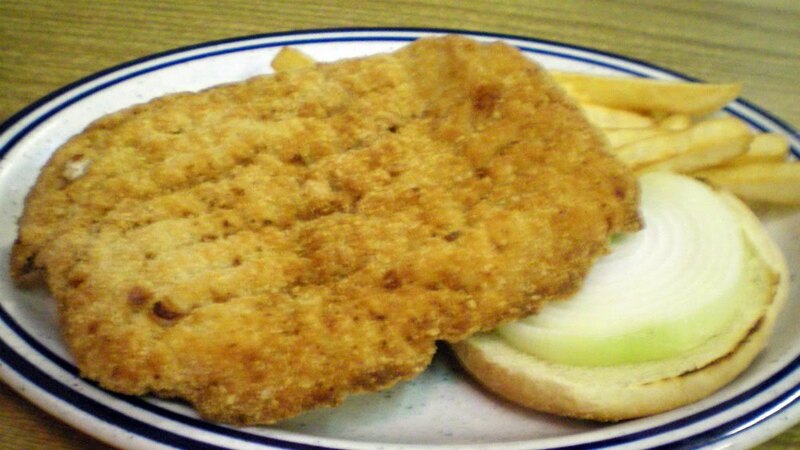 The Marion Maid Rite on the other side of town serves a "homemade giant iowa tenderloin" which they describe as "Best One Around!" along with homemade onion rings and pies. Location: 621 1st Ave SW just outside downtown Cedar Rapids in Eastern Iowa. Directions: First Avenue is the main drag through town if you are going east or west on Highway 151, or you can just find it by taking 1st street from downtown and looking for the small red striped shack. The Tenderloin: The first thing I noticed was a huge appendage of soft pork meat sticking out on one side. 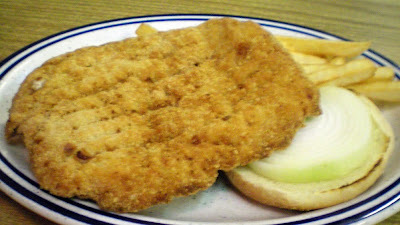 The whole sandwich is a big soft piece of pork with crunchy cracker-like breading that reached a good golden brown color. Its not thick, but is a little steamy inside. Served on a soft, very soft bun. Condiments were tucked under the meat and made a mound of onions and ketchup. This is an uncomplicated sandwich. Overall 7.4 out of ten. 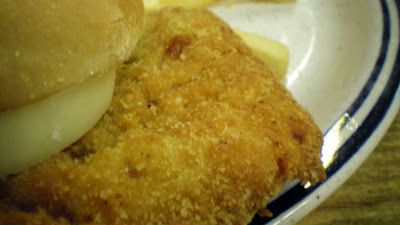 Also on the menu: There is the usual Maid Rite stuff, like Maid Rite sandwiches, chicken sandwich and bowls of chili. This location also serves goulash, roast pork, and has a waffle breakfast on Sundays. Ambiance: The dining area is small with booth seating and pictures of the flood and rebuilding effort. 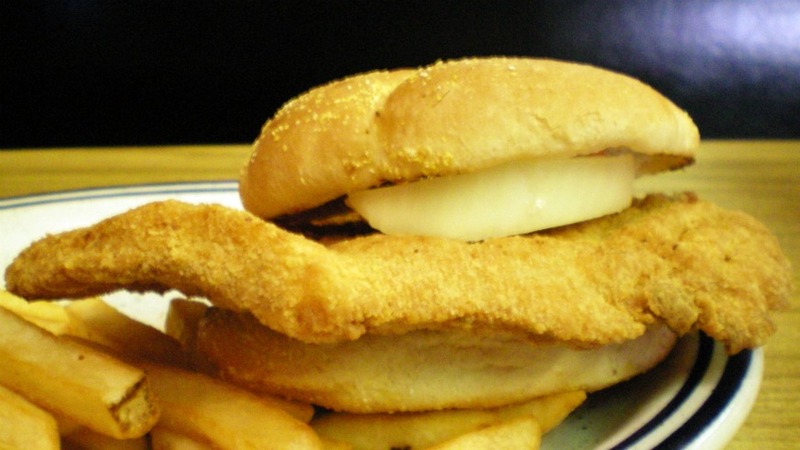 Final Thoughts: Cedar Rapids is a proud town that takes its tenderloins seriously. I know I am not really doing this town justice by starting out here. The Westside Maid Rite is just one of several places which have reopened since the flood. I also made it to the Czech Village to try Al's Blue Toad, and I will try to make it to Little Bohemia when they get their deep fryer running again.